Congratulations on taking the time to research pet ownership and become an informed responsible pet owner. These beautiful creatures of Mother Nature will steal your heart, but unfortunately, sometimes result in impulsive purchases. Animal Control Shelters throughout the country are at capacity and many being forced to euthanize these innocent pets. It is each our responsibility to help change this. The information you acquire will enable you to make the best informed decision, which will hopefully result in an appropriate selection. Domesticating dogs and cats has enabled a tremendous bond between man and animal, but also has diminished their natural survival skills and resulted in their total dependence on human care for their survival. Their willingness to give us unconditional love is their greatest gift, but their health and happiness is totally dependent on us. There are many overlooked considerations in purchasing a dog. They need leadership, no matter how large or small, how cute or innocent, they all need guidance and boundaries established. This takes time and effort, but the rewards are lifelong. One hour each day of structured obedience and play is recommended. Simply walking your dog on a leash each day can provide the leadership your dog needs. Without human leadership, you open the door for canine behavior not acceptable in most homes. A consistent effort of obedience training with positive reward for your dog works miracles. Dogs need a large fenced area to exercise, build muscle coordination, relieve stress of confinement, and natural sunlight for proper physical and mental health. This is extremely important for puppies and their orthopedic development. All fifty states have leash laws which require approved containment for your dog, usually a fence. Check with your local animal control for these regulations. Socialization of your canine companion provides a bond of trust with all humans. Even protection dogs are properly socialized prior to and throughout protection training. So many potential problems can be prevented through early socialization. Bringing your dog to pet friendly public places is fun, and can enhance both you and your dogs social life. My life experiences have taught me that pet owners are generally caring people, the type of person I like to socialize with. If you are unable to perform the training of your dog, select a Dog Breeder that can offer this service for you. The cost of dog ownership is usually underestimated. Many think that the purchase price of a dog or puppy is the majority of the expense. Healthy diet, Veterinarian services, training supplies, toys, grooming, travel crate, bedding, bowls, etc…. usually average from $60.00/ month to $300.00/ month throughout the life of your dog. Unhealthy and untrained dogs can cost significantly more. Dogs are a mans best friend through consistent efforts of communications with mutual respect. This respect motivates the loyal bond between man and dog and is the catalyst for amazing team work and cherished life experiences. A great tip in screening potential dog breeders and cat breeders, is to select one that also screens you. Breeders that truly care about their occupation want the best homes possible for their puppies or kittens. They should have as many questions about you as you have about them. They should be willing to offer information particular to their pets, provide Veterinarian references, and test your knowledge of the breed. Though some may be offended by the questions of a breeder, it is a sign that this breeder cares. If all breeders conducted thorough screening of potential customers, there would be far less homeless pets. No reputable breeder will sell their pets through pet stores, agents, or organizations. They want to know exactly where there pets are going. Breeders should have enough experience to offer ongoing assistance with information and training of your new pet, and request that they be contacted first, should you ever have to give up your pet. They should be willing to allow a visit and inspection. You should be able to meet and evaluate the parents of your potential new pet. 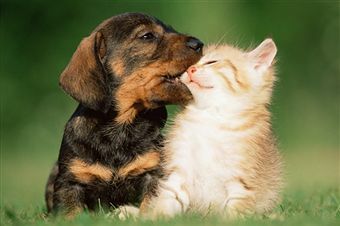 Puppies and kittens should be socialized by the breeder prior to purchase and their parents should demonstrate a calm sociable temperament, regardless of the breed. Puppies and kittens should have their first series of inoculations prior to leaving their cattery or kennel. The breeder should also recommend that you schedule a Veterinarian visit as soon as possible with your new pet and that the sale and transfer of ownership is dependent on the results of that medical examination. Experience is the first question you should have for a potential breeder. You should have conducted enough research about the breed to ask intelligent questions the breeder should know. The breeder should be willing to offer useful information and be willing to provide references. Anyone can provide customer references, but reputable breeders should provide professional references. The best reference is from a practicing Veterinarian. They are very knowledgeable professionals bound by ethics. Just as a car fax is important in purchasing a preowned vehicle, a Veterinarian reference is important in purchasing a pet. Your breeder should guarantee your pet to be healthy, both physically and psychologically, and also genetically. The genetic problems are those that usually show up later in life. The breeder should have proof of genetic screening of your pets parents and the pedigree to prove no inbreeding. The Orthopedic Foundation for Animals, is trusted with testing, certifications, and breed history data relative to genetic problems associated with particular breeds of animals. Many People believe that if a dog or cat is registered to be pure bred, then it is also an endorsement of the quality of the pet. This is not true. Registries are only data collectors that sell registration certificates based on trust. As long as these registries will register the offspring of a Father and Daughter breedings (inbreeding), their true objective should be questioned. They are making progress however with kennel inspections, DNA profiling, and microchip identification, but still have not made progress in preventing inbreeding, and limiting breeding to only genetically health dogs and cats. You have the responsibility to research your breed and learn what is pertinent to that breed. This new pet will become a loved member of your family for years to come if you do your home work. The internet offers a world of information, some useful and some worthless. Medical data should be trusted to .edu or .gov websites only. Technical information posted on the internet should also provide valid references, scientific conclusions, and not someones opinion without supporting facts and/or data. There are many so-called premium pet foods available in stores today; unfortunately, they are all lacking in a primary ingredient, freshness. Commercial pet foods are usually manufactured by grain mills with ingredients not always of human grade. They are stored in truck trailers, warehouses, and on the shelves of stores for an average of six months before you purchase them. Our pets deserve better; moreover, our pets require better. One company is rewriting the way pet foods are produced and delivered. With the guidance of our nations leading nutritionist, Dr. Jane Bicks DVM, a product named Life’s Abundance has been developed. This product is superior to any other pet food combination of ingredients and is delivered to your door each month fresh, usually in less than six weeks from production. Our pets can no longer forage for what their bodies need, they are totally dependent on us to provide their nutrition. I sleep better at night knowing I am giving my dogs and cats the very best and endorse this product with confidence. Everyone should read this article prior to purchasing a pet. I cannot emphasize the horror of euthanizing thousands of innocent pets because of irresponsible people. This problem can be handled responsibly and thanks to the author, who is also a breeder, for making prospective customers aware. I think experience is a key factor in selecting a breeder. Many buy cute before researching the breed or the breeder. Good points brought up here. Did not realize I was feeding stale food to my cats, but after checking the 18 month expiration date, I found the food I was buying to be almost one year old. Thanks from me and my fuzzy friend.